Frozen French fries can be substituted for the fresh potato fries in this recipe. Chef Burke suggests toasting them in hot oil prior to lining the ring mold. 1. Cook potatoes in salted, boiling water until tender, about 25 minutes. Drain and mash; add butter, oil, milk, and seasonings. Puree gradually until smooth. 2. For each Charlotte, line 4½” ring mold with French fries, packing tightly. Secure with 3½” ring mold pressed inside. Deep-fry at 350°F until golden and crisp, about 2 minutes. Drain; remove rings and unmold onto plate. Fill with whipped potatoes. Season short ribs with salt and pepper. Heat vegetable oil in roasting pan; brown meat. Drain fat. Add vegetables and herbs; brown lightly. Add wine and stock; bring to boil. Cover and braise in 375°F oven, 1½ hours. Skim fat. Remove meat. Strain vegetables and discard. Reduce liquid to 1 pint. Add butter and mustard. Pour sauce over meat and reserve. Heat olive oil in skillet. Add shrimp; sauté 2 minutes. Add garlic and chives; cook 1 minute longer. 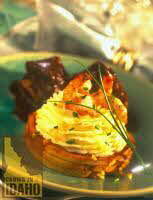 Assemble by placing a potato Charlotte on each plate. Place 3 shrimp on top with 2 short ribs and sauce.